The remote mountains and plateaus where the states of Jalisco, Nayarit and Zacatecas all meet is home to some 18,000 Huichol Indians, as well as their close cousins, the Cora. The Huichol (Wixárika = “the healers” in their own language) live in scattered, extended family, settlements (ranchos) and rely entirely on oral tradition. They are intensely religious, and see their time-honored responsiblity as protecting nature’s creations. Their shamen perform elaborate ceremonies to a pantheon of gods to ensure bountiful crops, health and prosperity, as well as to preserve nature and heal the Earth. 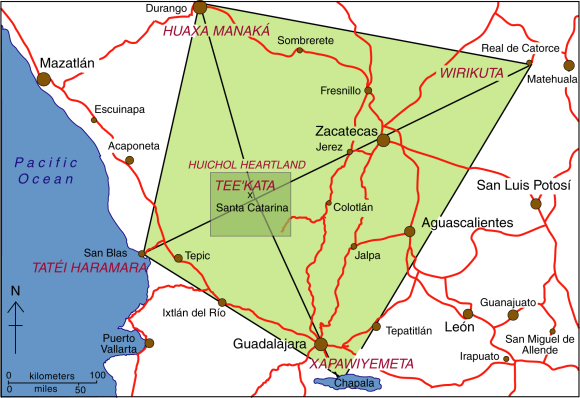 The center of the Huichol world – Tee’kata (see map) – coincides with the village of Santa Catarina in the Huichol heartland. Central to some Huichol ceremonies is peyote, an hallucinogenic cactus, obtained from an annual pilgrimage eastwards to the sacred land of Wirikuta, near Real de Catorce in San Luis Potosí. The pilgrimage is an 800 km (500 mile) round trip. Peyote (Lophophora williamsii) is called jicuri by the Huichol. The sacred geography of Mexico’s Huichol Indians. Credit: Tony Burton/Geo-Mexico; all rights reserved. Every rhombus has four corner points and a center. 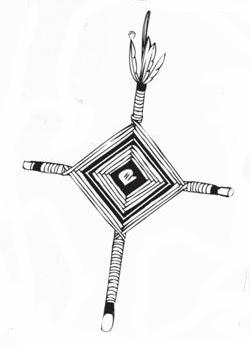 Their traditional yarn crosses (often mistakenly referred to as “God’s Eyes”) are made by wrapping colored yarn around two twigs to form a rhombus of color. Most yarn crosses use several different colors. Compound yarn crosses are made by adding small yarn crosses at each end of the two main supporting twigs, giving five crosses (eyes) in total. Huichol fathers will make a simple yarn cross when a child is born, adding additional crosses annually until the yarn cross is considered complete. This, of course, is assuming that the child survives, given that infant mortality among the Huichol is very high. The colors used in Huichol artwork also carry lots of symbolism. For example, blue is taken to mean water or rain and associated with Lake Chapala to the south. Black symbolizes death and is linked to the Pacific Ocean in the west. Red, the color for mother, is usually reserved for sacred places such as Wirikuta in the east. White (clouds) is associated with the north.